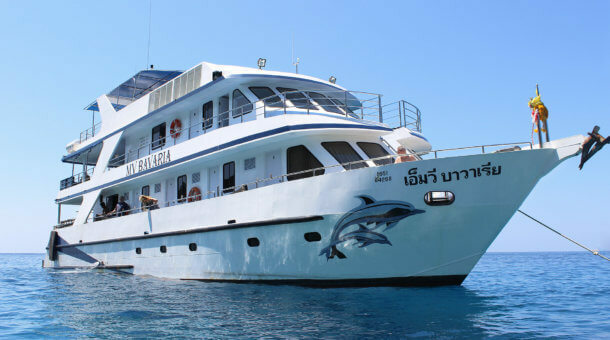 Raja Manta is a high quality boat, modern and spacious and will take a maximum 20 guests on Indonesia trips. There are trips in Raja Ampat, Ambon and Sangalaki as well as crossing trips between these locations visiting Lembeh and the Ring of Fire - early booking is strongly recommended. 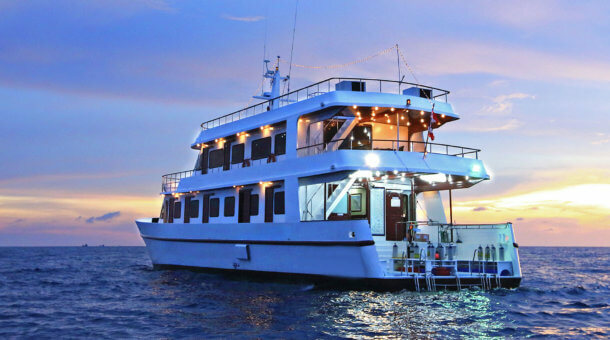 One of our top recommendations for a variety of diving locations - you can do several trips on this boat in different areas of Indonesia. All trip prices are quoted per person. NOTE: Raja Manta has many different trips, trip lengths and special trips. 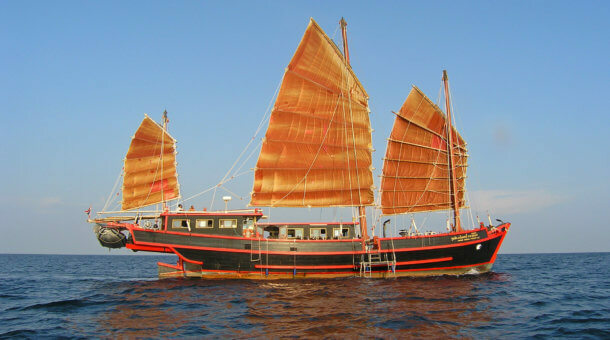 Raja Manta was built in Phuket, Thailand and started operating Similan Islands liveaboards trips in November 2011. She relocated to Indonesia in August 2016. Raja Manta is a top class boat with 12 spacious cabins. The boat is a big one – 36 meters long with a beam of 7.5 meters. Lots of space! For Indonesia trips the maximum number of guests will be limited to 22. The indoor saloon is 500 sq feet with dining table and sofas. There is a 42 inch plasma TV with 500 movies to choose from! Outdoors you have a 600 sq foot dining area and there is a 1000 sq foot sundeck too! The Raja Manta cabins – there are 5 deluxe double cabins – 2 on the top deck, 2 on the main deck. There are 4 deluxe twin cabins on the main deck. These 8 deluxe cabins have private bathrooms. 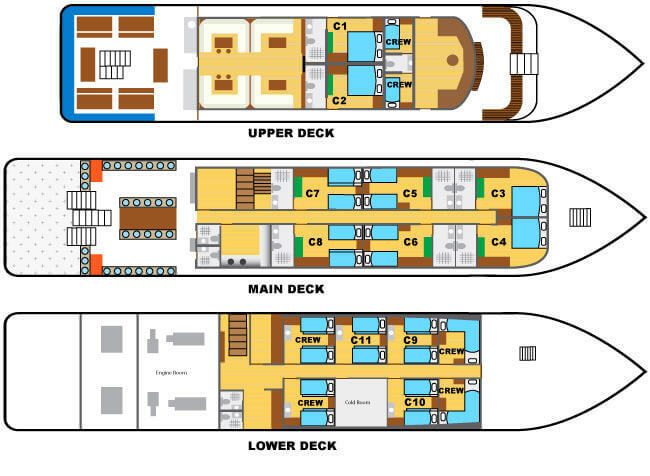 On the lower deck are 4 standard twin cabins using shared bathrooms. 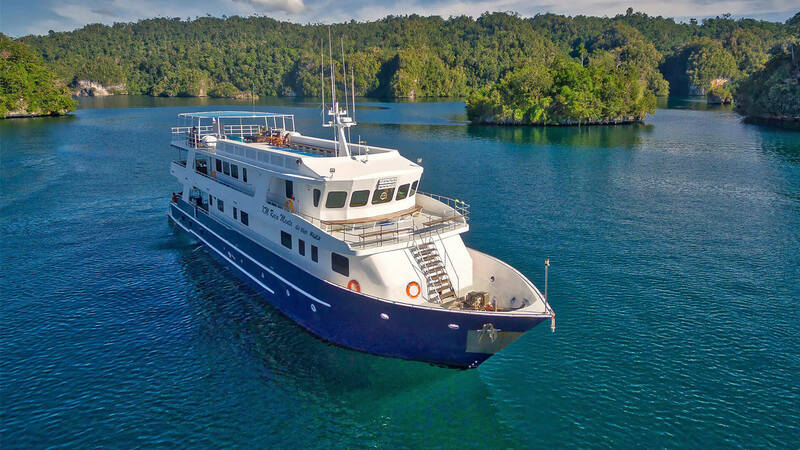 For Indonesia trips only 3 of the standard cabins will be occupied, limiting the number of guests to 22, although you can take a few more if you charter the whole boat! The dive deck is very spacious, and diving is made in small groups of 4 – 5 divers with a dive guide / instructor. No less than 3 RIBs (dinghies) assist with pick ups and drop offs. Nitrox is available on board @ 5 US$ per 12 liter tank fill or 5 US$ per diving day. Raja Manta has a schedule consisting of trips in many locations and with trip duration from 6 to 11 nights departing from Sorong, Ambon, Manado, Berau and more. Please do check the full schedule and send a trip enquiry or simply contact us with your planned diving dates and we can suggest a trip and send you trip details and a full itinerary. There’s too much information for one page here! We will try to add downloadable itinerary files in the near future. Please complete the form below to send an availability or booking enquiry to Sunrise Divers. 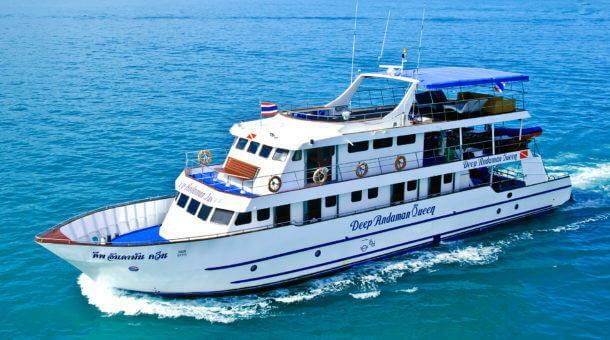 You are also welcome to send a direct email to info@sunrise-divers.com or call our mobile hotline +66846264646. We are based in Phuket, Thailand. We will reply as soon as possible with full trip information and details on how to make a booking. We look forward to hearing from you soon!